Last Sunday’s Gospel about the wedding at Cana prompted me to write about the Sacrament of Marriage. Today I would like to continue those reflections on marriage. The Church teaches – following from Sacred Scripture – that marriage has two main purposes. In other words, there are two reasons why people get married. For Love and for Life. Love: the intimate, exclusive marital friendship which forms an unbreakable bond between husband and wife. Life: for the blessings of children. “From the beginning”, as Jesus elsewhere says in the Gospel, God intended marriage to have these two qualities. In fact, husband and wife express both these realities not only in words but in the “language of their bodies”, as Saint Pope John Paul II says in his writings. It is not an accident that the physical act by which man and woman – husband and wife – most intimately and exclusively express and deepen their love for each other is also the means by which new life is generated. God intended it that way. The connection between these two purposes of marriage – Love and Life – is written in the very language of our bodies. This is why the Church, ever faithful to the teachings of the Scriptures and the teachings of Jesus, continues to teach this sublime truth; and also why the Church is always vigilant for anything which might assault the dignity of marriage. When Love and Life are separated from each other or from the bond of marriage, great harm comes to individuals, to families, and to society. This is why artificial contraception and sterilization – and sexual activity outside of marriage – are morally wrong. They separate what God intends to be united: Love and Life and marriage. I leave early Friday (Feb. 1) for a quick weekend visit to Dayton, OH, to baptize my grand-niece. (This is among the ‘perks’ of being a Priest: celebrating the Sacraments for family!) 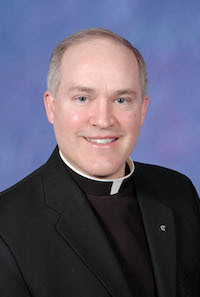 Next weekend we will have a visiting priest from Cross Catholic Outreach, Fr. Richard Kunzman.